To support education and research in the Division of Electrical and Computer Engineering, PreSonus Audio Electronics has pledged $200,000 to establish a digital signal processing (DSP) laboratory. "As a graduate of LSU Engineering and a Louisiana entrepreneur, I believe that investment in our home-grown technical workforce is essential in our efforts toward economic growth," comments Jim Odom, co-founder, PreSonus. "Our intention for this grant is to assist LSU Engineering in becoming a top ten destination for technical education. The burgeoning industry of digital everything will require highly skilled and trained individuals, and LSU is perfectly positioned to meet this challenge." PreSonus, cofounded in 1995 by LSU electrical engineering alumni Jim Odom and Brian Smith, is a manufacturer of audio electronics and software used in TV and radio broadcast, live-event sound reinforcement, and professional recording studios. "Jim and Brian provide an exemplary case of entrepreneurial spirit present in LSU's electrical and computer engineering graduates," said Pratul Ajmera, interim chair, LSU Division of Electrical and Computer Engineering. "We thank PreSonus for this significant investment that enhances our educational program and helps us produce world-class graduates competitive in the digital media and digital audio industries." 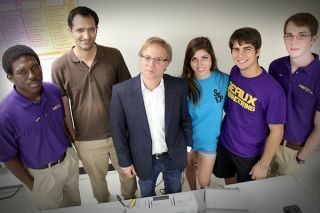 A global company, PreSonus is an active recruiter of LSU students for both internships and post-graduation employment. Currently, an estimated 16 LSU alumni are employed there, including 7 engineers. LSU's ECE Division currently enrolls 350 undergraduate students and 102 graduate students. During the past five years, the division has, on average, granted more than 80 bachelor's degrees, 25 master's degrees, and more than five PhD degrees annually.